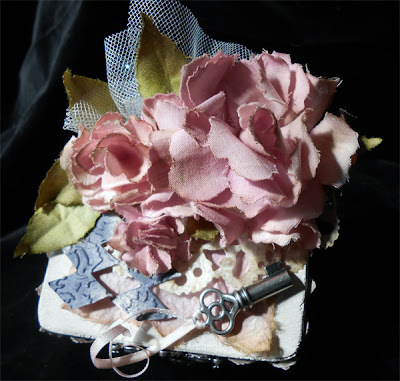 Since the Tim Holtz challenge, several ideas filled my mind. 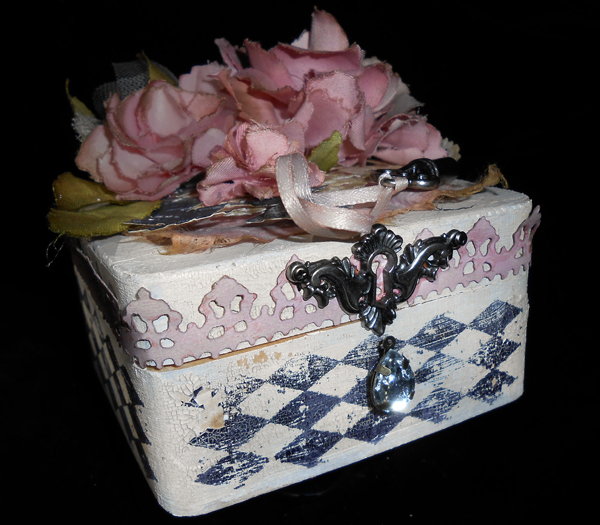 This box which I have named "Tim Box" because of all the Tim Holtz products used, was one I choose to tackle. 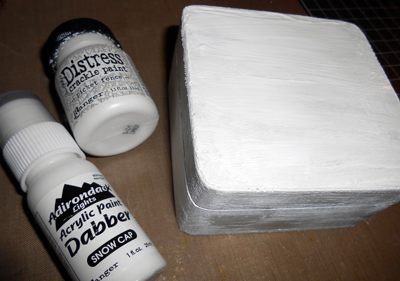 Started with a small wooden box I bought from Dollar Tree and first painted it with Adirondack Acrylic Paint Dabber in Snow Cap. Once dry, I put a heave coat of Ranger, Tim Holtz Distress Crackle Paint, Picket Fence. Yes, this is was too white for this project. Adding a bit of Frayed Burlap Ranger TIm Holtz Distress Ink, once dried gave it an antique look. 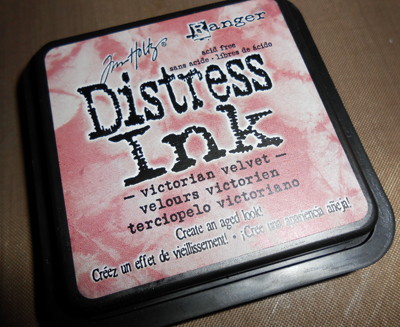 Using Ranger Archival Ink and the harlequin stamp from the Tim Holtz Visual Artistry French Market Clear Stamp set, I stamped the bottom portion of each side. Pinks, I used Ranger Tim Holtz Distress Ink Victorian Velvet using Tim's method (except strip) of dabbing some on Inkssentials Non-Stick Craft Sheet with a little water spritzing a little water. Visit Tim's site for the how-to video. When dry, follow with bushing on edges Frayed Burlap ink. 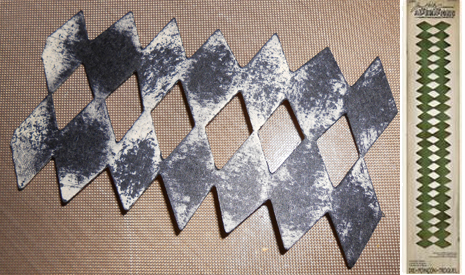 Background paper was handmade paper (white). 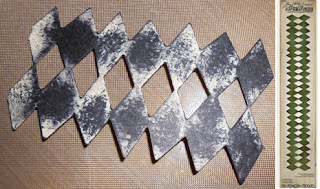 Use a paint brush with water to "cut" paper. Basically draw a line with water, get it very wet and pull part to keep soft edges. After you ink paper, scruck it a bit so it's not so flat, let edges curl up. Set aside to dry. Roses, use Sizzix Tim Holtz Bigz Die Tattered Florals and polished cotton fabric, white. After inking while wet, fold flower in half, then in half again. Roll it into a cone, shaping center to resemble the center of a rose. Support it for drying, I used the hole in a ribbon spool. 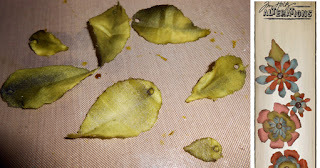 You will need 5-7 Large petals and 4-6 of the others (except pointy petals). Assembly, I used all the same size petals for each rose and did not combine sizes. 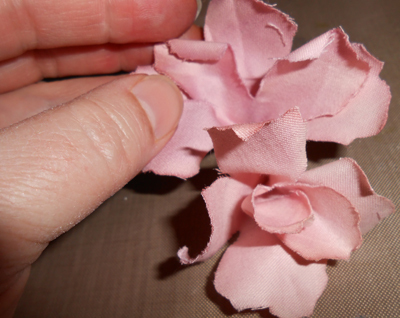 Using a low-temp hot glue gun, choose best for center of rose and then unfold other petals, leaving them folded only in half. Glue around chosen center. Add as many of these as desired. I used 5 on large, but I think 7 would be better. Repeat for other two flowers starting with using 4 petals. 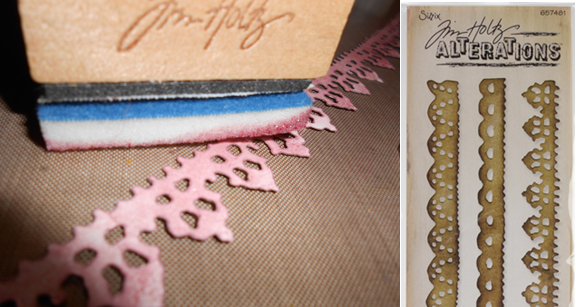 The Tim Holtz Alterations Sizzlits Decorative Strip Tattered Flower Garland was the perfect solution for leaves. 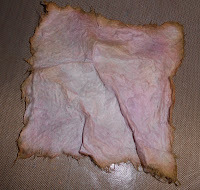 This also cut from the polished cotton, distress ink was used here. I used Forest Moss and a little Frayed Burlap. To create border around upper edge, Sizzix Sizzlits Decorative Strip Vintage Lace die by Tim Holtz was cut out of a recycled gift box and inked with Victorian Velvet and Frayed Burlap. 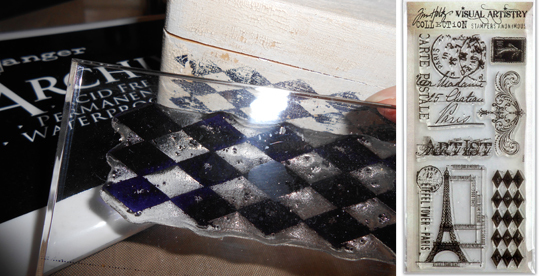 Diamond were also cut from a recycled gift box using Sizzix Sizzlits Decorative Strip die Harlequin Border by Tim Holtz. 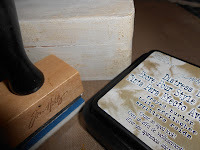 Cut to size then use Ranger Archival Ink to create a distressed look and added Sizzix Tim Holtz Texture Fades, Damask. 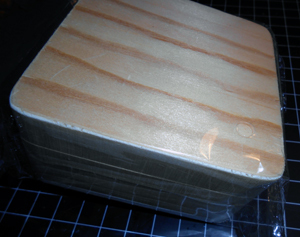 To frill this box up, more handmade paper was used. 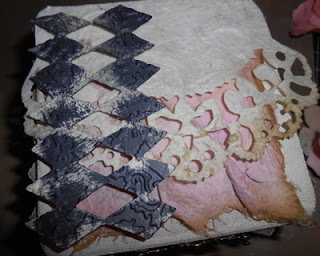 Sizzix Alteration Tim Holtz On the Edge Distressed Doily die worked great with this paper. Added a touch of Frayed Burlap to added a little antique look to it. 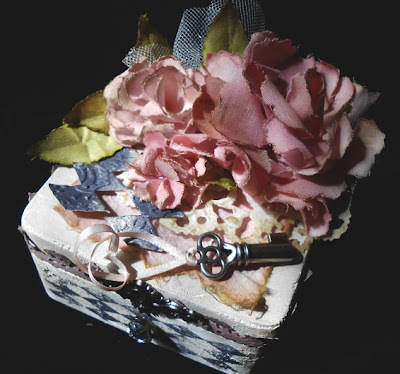 Assemble top of box as shown and add hardware from Tim Holtz Idea-ology Findings Locket Keys and . Add roses, leaves, key and netting with hot glue. Your rose box is absolutely beautiful! Thank you for sharing your link in your comment on my site. Your roses are stunning! Wow I love those big blousy roses on the box. Good luck in the challenge. A lovely box with all your added details...gorgeous flowers...good luck in the challenge!! This is just beautiful! Thanks for stopping by my blog for a visit!Great job on this box! Beautiful, thanks for the link on my blog. Completely amazing flowers! And the box as a whole is just lovely... thanks for the visit and good luck to you too! Gorgeous! And I like all the step-by-step pics showing how it was made!! Gorgeous! Awesome job on the roses! I LOVE your Tim Box! I am drooling, as it is so feminine and has pink roses. 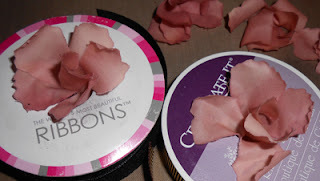 I have never used the die in that way by cutting and assembling the roses, such a great idea! I will have to try it. Thanks so much for the kind visit and comment. Made my evening. Off to check your other entry too! Woah! Your box is amazing, well done it looks rich and delicious!! I love the way you worked with the several Tim Products!! Your roses are amazing! They look so realistic. Best of luck. Absolutely gorgeous rose! I may have to try this! Your box is simply fabulous!! Thank you for your lovely comment on my Victorian mini-tophat!!! This box is gorgeous! And the roses are just stunning! Beautiful work!